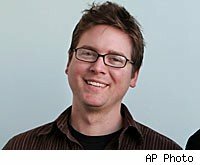 Twitter co-founder and CEO Biz Stone said Thursday that Rupert Murdoch's potential plan to block Google from searching New Corp.'s (NWS) websites is doomed to fail. Murdoch has accused Google (GOOG) of stealing content from his publications, which include The Wall Street Journal and the New York Post in the U.S., and The Times and The Sun in the United Kingdom. The cantankerous tycoon said last week that blocking Google could be part of his strategy to get more people to pay for content online. Here's a young man, all of 35, who runs a company that makes no money, telling an old man, 78, who runs companies that have made billions, that he is wrong. But while it's easy to dismiss Stone's comments as youthful bravado, I think he's giving Murdoch some valuable advice. With gadgets like the Apple (AAPL) iPhone becoming more common, media content is increasingly ubiquitous. And as much as readers may value a good story written by a Wall Street Journal reporter, only a minority is willing to pay for it. That's the new media reality and the basis of Stone's criticism. Murdoch may be counting on people adopting new technology platforms -- like newspapers on pocket-sized, flexible plastic that refresh in real-time -- slowly, giving him more time to milk existing audiences and infrastructure. But while there will likely always be some readers willing to pay for content, what Stone is saying is that so much information will be available for free that Murdoch will ultimately lose the battle between his pay-for-news and free, advertiser-supported news. Instead, News Corp. (NWS) "should be looking at this as an opportunity to try something radically different and find out a way to make a ton of money from being radically open rather than some money from being ridiculously closed," Stone told an audience at an event organized by the National Endowment for Science, Technology and the Arts in London, the BBC reported Thursday. It's solid advice from Stone, who is figuring out how to turn Twitter into a money-making platform. Murdoch has now admitted some anxiety about the changing media landscape, saying, "We find ourselves in the midst of an information revolution that is both exciting and unsettling." His comments, reported by Dow Jones Newswires, came in videotaped remarks Thursday. Maybe Murdoch is right to charge for what he can and make money where he can get it from his news content. But I don't think so. Demand for free content will eventually overwhelm the supply of people willing to pay for it. Anthony Massucci is a senior writer and columnist for DailyFinance. You may follow him on Twitter at hianthony.